By Jake Rocheleau in Graphics. Updated on April 9, 2018 . Cheesy stock photography is on the way out being replaced by quality stock photos, many of which can be downloaded for free. Yes, there are plenty of paid photo sites but the free ones are easier to use and more accessible with a $0 price tag. One of the newest sites in this arena is FFCU, an abbreviation of Free For Commercial Use. It’s not the catchiest name but the content is phenomenal. At the time of this writing, FFCU has almost 1,000 images available for download. 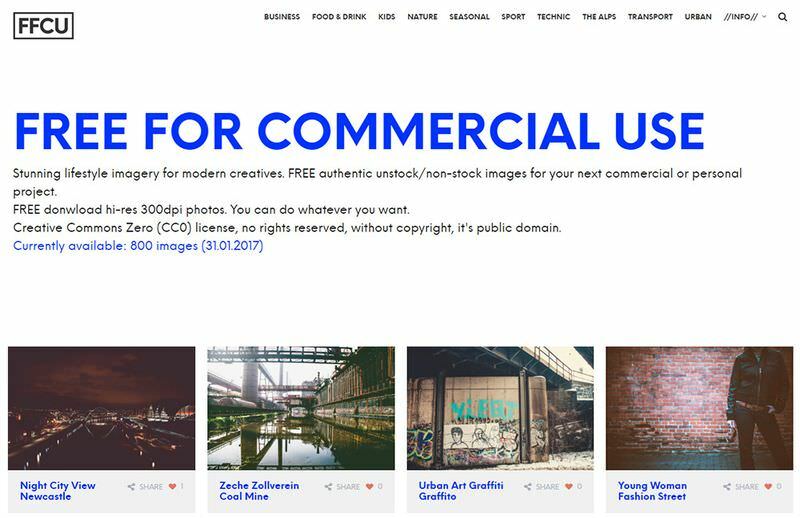 All photos submitted to the site reside under a CC0 license which means completely free public domain images for any purpose. You can read more about the launch & mission statement on their About page. You can basically do whatever you want with these images and use them in websites, posters, graphic designs, or whatever. No attribution is required but it’s always appreciated. Why “The Alps” has its own category I cannot say. But for a library of almost 1,000 free CC0 images, I can’t complain either. One other thing I noticed is that a few pages on the site use German in the title (like the Search/Not found page). I know designers are always looking for that next great resource, so FFCU might be worth a peek. It’s a niche library with strange categories but the photos are all very good quality. And, they look like genuine photos which is a refreshing change from the cheesy stock photography we’re all familiar with.